Maria and Jason contacted me on a Saturday afternoon. They were in Atlanta for the weekend and wanted to visit me to see samples of my work. Luckily I was able to meet them before they returned to their home in Albany later that afternoon! They were interested in a custom design for their save-the-dates and wedding invitations. She mentioned she wanted her save-the-dates contemporary but slightly playful. She liked swirl as well, no flowers and her wedding would be very elegant so I went to work. Her colors were chocolate with touches of fuchsia and orchid green. With Maria living out-of-town, we handled everything via email. 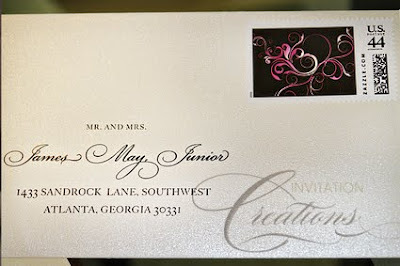 She ultimately chose a contemporary design swirl which is one of my all-time favs. 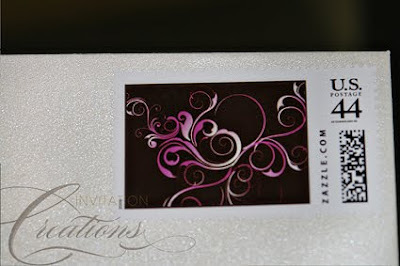 Another detail she had seen that she fell in love with were the custom stamps. I've said it so many times, I love , love , love when customers add the extra customized stamps. They always complete such a unique project. 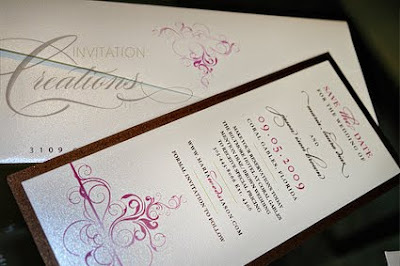 I also addressed her envelopes using the same fonts as the save the dates. I can't wait to design her invitations!